City's Vice-Chancellor, Professor Paul Curran, was one of the speakers at the annual Chancellor's Dinner at The Mansion House on Thursday 7 April. 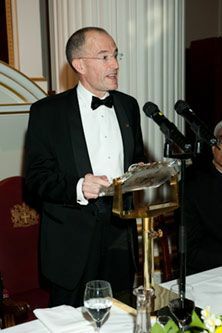 The Lord Mayor of London, Alderman Michael Bear, is the Chancellor of City University London and hosted the annual Dinner for friends and benefactors of the University. Professor Curran took the opportunity to announce the University's tuition fees for home and EU undergraduates for 2012 entry. The fees will be £9,000 per year subject to agreement by the Office for Fair Access (OFFA) and Professor Curran explained how they were necessary to maintain the high-quality of City's undergraduate programmes. Professor Curran also outlined generous investment in outreach and retention activities, including a commitment to match funding for the new National Student Scholarships scheme. Please see here for Professor Curran's full speech and here for more details on the City of London and The Lord Mayor of London.